FULL-TIME: The Highlanders have defeated the Rebels 43-37 with a big final 20 minutes. Massive run out wide by the Rebels looks like a winning play but Naholo gets the turnover and the Highlanders kick the ball into touch. Siren sounds - Rebels have one last play. PENALTY REBELS - hands in the ruck. PENALTY HIGHLANDERS - high tackle. NO TRY! Final pass has been ruled forward so the ensuing try has been disallowed. Earlier penalty will come into play. Rebels on the attack into Highlanders half. CONVERSION! Highlanders (Sopoaga) 36-34 ... as the Highlanders take the lead for the first time and the Rebels MUST fight back if they are to make the finals. A running break found the Rebels defence unprepared. PENALTY HIGHLANDERS - not releasing the ball. Highlanders completely fumble what should have been a good lineout position deep in opposition territory. Rebels on the attack. PENALTY HIGHLANDERS - entering the tackle zone incorrectly. PENALTY HIGHLANDERS - not rolling away. Magic with the boot tonight by Hodge - 6 from 6! PENALTY REBELS - not releasing the ball. Another charge down gives Reece Hodge a third try! And just like that the Highlanders fumble the ball. Rebels get the scrum feed. Highlanders were edging forward into the Rebels half with each pass and tackle contest - but eventually a forward pass undid the good work. Scrum Feed Highlanders at the 22 in their own half. Hodge thumps the ball into touch at the opposition 22 and the Rebels go on the attack. 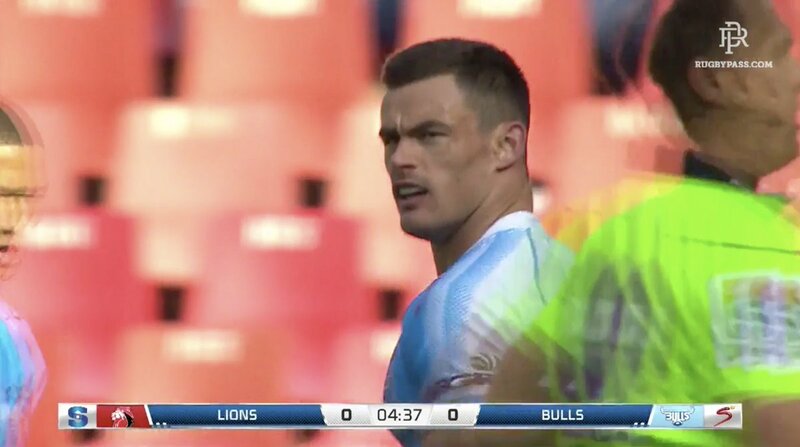 The second half is underway in Dunedin as the Rebels try to secure a place in the Super Rugby finals. HALF-TIME: Rebels lead the Highlanders 24-22 in Dunedin after a frenetic first half which saw the ball go end-to-end and change hands many times. MISSED CONVERSION! Sopoaga's kick hits the right-hand post. TRY! Rebels (Hodge) 17-22 ... Hodge gets his second of the match after a brilliant charge down to secure the turnover and run unchallenged to the posts. TRY! Highlanders (Kayne Hammington) 15-17 Momentum quickly turns as yet another turnover goes against the Rebels. Adding salt to the wound for the Rebels a free kick is awarded to the Highlanders for time-wasting at the lineout by the men in blue. They had been warned. TRY! Highlanders (Waisake Naholo) 8-17 Naholo turns the tables on the Rebels out wide to make a run down the same sideline in the opposite direction ,all the way to the try line. One man down is not going to stop the Rebels trying as Koroibete looks to make a run down the line but Naholo loads him into touch and saves a probable try. YELLOW CARD REBELS - Ruru off to the bin. TMO - potential foul play being checked after Michael Ruru looks to have stuck his foot out to trip Sopoaga. 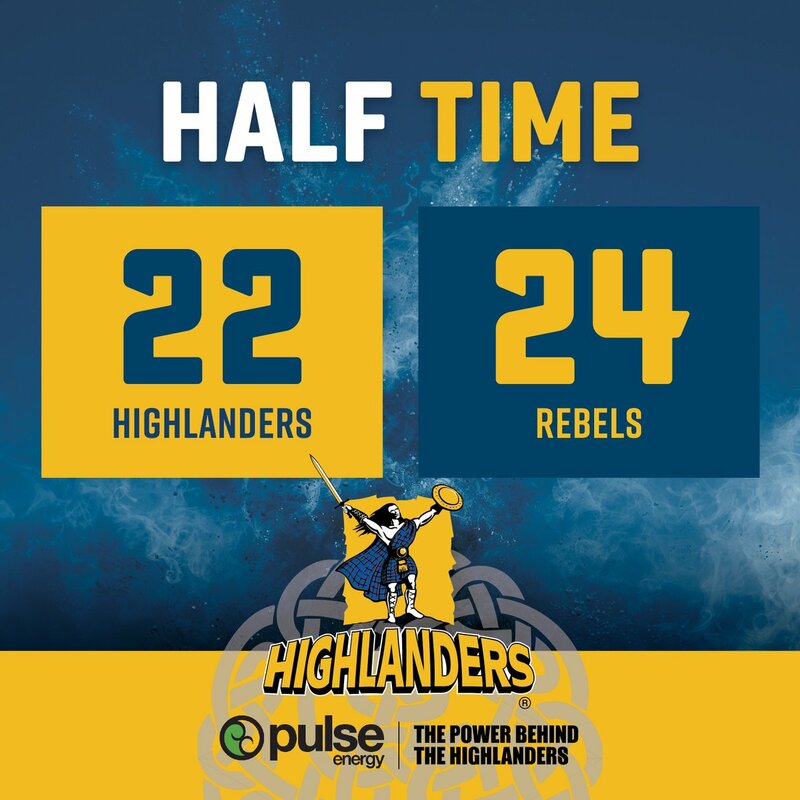 Highlanders possession short-lived as the Rebels retake the ball and go into attack in the opposition half. Both teams have gone end-to-end but the Rebels have made the most of the scoring opportunities which have emerged. Rebels defence is loading the pressure on the Highlanders when they get the ball and forcing errors. Ball like a 'hot potato' and eventually ends up in touch in the Rebels half. Scrum feed to the Highlanders. Rebels need to be careful of not wasting opportunities when they emerge from opposition errors. Handling errors creeping in on both sides. Handling error stalls the Highlanders counter-attack deep in Rebels territory. Hodge kicks to the corner rather than at the posts showing intent. PENALTY REBELS - Highlanders front row collapsing. PENALTY HIGHLANDERS - Hands in the Ruck. Highlanders electing to do a fair amount of early kicking to gain ground. Hodge immediately plants the foot and lines up the shot. Rebels get some good first possession close to the Highlanders' 22. Teams are on the park, under the roof in Dunedin, and are ready to get this crucial contest underway. Wallabies duties have also depleted the Rebels of several star players - Will Genia, Dane Haylett-Petty and skipper Adam Coleman. Having said that, the Highlanders too are affected by All Blacks secondment. The Highlanders have a strong record historically against the Rebels but are coming off two substantial losses - three in the last five matches. This is a must-win game for the Rebels if they want to ensure their place in the finals. Wins for Australian conference teams in New Zealand are rare, but the Rebels are the only team to have secured one this season and will therefore be looking to repeat that feat. Super Rugby Saturday will kickoff shortly when the Highlanders host the Rebels at Forsyth Barr Stadium in Dunedin. UPDATE: The bonus point loss puts the Rebels 4 points ahead of the Sharks. FULL TIME | Heartbreak in Dunedin with an exciting finish. Hodge finishes with 29 of our points. The Rebels lead by 2 after 40 minutes!